When it comes to the holidays, I am usually just trying to keep my head above water. I honestly dread the month of December. I feel like it is over before it even begins. There are parties to attend, gifts to buy and schedules to be coordinated. The month is full of expectations and disappointments along with a dose of jolly and cheer. The kids get out of school for nearly 3 weeks between Thanksgiving and the new year which for a work from home mom can be pretty painful. It’s the time of year that I am the least productive professionally speaking. This season also means my kids want to get crafty. For the record, and I will not apologize, I am just not a crafty mom. Glitter sends me into a panic attack and my blood pressure rises at the thought of creating handmade ornaments. I also hear the phase, “I want” ten million times. We can be walking through the grocery store and somehow they have found something on aisle 5 to add to their wish list. I don’t think I’m alone in feeling this way. Not only do we feel overwhelmed but we can also feel lonely. The holidays can be a trigger for remembering loss—loss of loved ones or even the loss of dreams. With so many people and emotions tugging at our minds and hearts, it's easy to feel like we are caught up in the hustle. We can easily be filled with stress and find ourselves down counting the days until December 26. With so many obstacles, expectations and stress, there has to be a way to not only survive it, but to survive it well. I decided to write a short ebook to give you some tips on how to enjoy the holiday season. 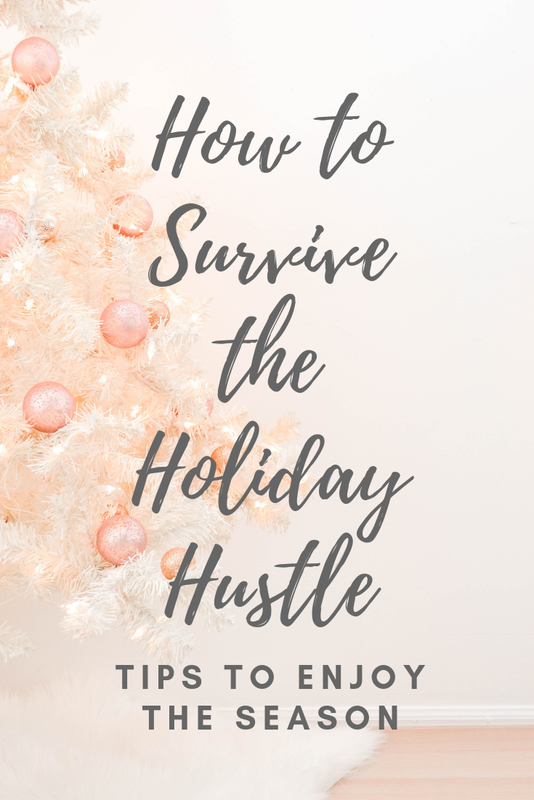 The ebook, Surviving the Holiday Hustle, I share 12 tips that have helped me survive the holidays. Each tip includes a way to take action that day. This season doesn’t have to be one of dread. We can actually find ways to survive it and quite possibly enjoy it. Good news! The ebook is FREE. Simply sign up for the email list and the ebook will be sent to your inbox. Surviving The Holiday Hustle Tips to Enjoy the Season. Sign up to receive emails from Sarah and you'll receive a free Christmas ebook. I promise not to bombard you with emails--ain't nobody got time for that! Thank you for signing up. You will receive an email with a link to download the ebook.